If the Southwest is calling for you, a timeshare in Santa Fe might be perfect vacation investment. Vacationing has never been more affordable than it has with timeshare resales and rentals. Contact our specialists today to learn more about how you can save on your next trip to Santa Fe, New Mexico. What’s My Santa Fe Timeshare Worth? Over one million people visit Santa Fe each year and for good reason. Between the incredible art scene, blend of different cultures, delicious Southwestern food, and outdoor activities during every season, it’s no wonder so many have invested in Santa Fe timeshares to spend their vacations year after year. Located in northern New Mexico, Santa Fe is a city known for its culture and history of Native, Spanish, and eastern settlers. For thousands of years, it has been inhabited by people from all walks of life and has created a vibrant, artistic, and colorful city of friendly locals. From art museums which preserve history and inspire others to the historical sites that can be found in every corner, Santa Fe is a great place to vacation and explore. One way to find savings when planning for your annual vacation is with a Santa Fe timeshare resale or rental. SellMyTimeshareNow.com is a leader in the timeshare resale industry and we can help you connect with owners selling or renting their timeshares for a fraction of the cost. Contact one of our timeshare specialists today to ask further questions about available Santa Fe resorts by filling out our contact form or by calling 1-877-815-4227. The Museum of International Folk Art is a place that was created to display the craftsmanship of different cultures and display the commonalities between different groups of people. Today, it is home to a enormous collection of folk and traditional art from around the globe and one of the only museums dedicated to such art. The San Miguel Chapel, also referred to as San Miguel Mission, is the oldest church in the United States. Since being rebuilt in 1710, there has been significant preservation construction and is now a wonderful place to visit for the restored artwork which was created by famous, local painters hundreds of years ago. The Museum of Spanish Colonial Art works to preserve the Hispano art that has been created since Spanish settlers came into New Mexico and Colorado over 90 years ago. There are over 3,700 objects within the collection from a variety of years, depicting the Spanish Colonial culture for all to appreciate and see. You will never want to leave once you spend one night at one of these Santa Fe resorts. With comfortable accommodations and on-site amenities such as swimming pools, hot tubs, and fitness centers, these timeshares are second to none. This city is known for having an amazing art culture and is home to over 200 museums. Throughout the year, there are shows and markets to display talented artists work for viewing and for purchase. It’s no surprise that many visitors will spend time in these incredible places, viewing some of the most sought-after art in the world. With over 300 days of sun in Santa Fe, you will love to spend all of your time outdoors. Biking, golfing hiking, rafting, horseback riding, guided tours, and fishing are just a few of the fun outdoor activities for the entire family. You’re bound to find something you love during your vacation in this beautiful city. Santa Fe has a rich culture because it has become a melting pot for so many groups of people for over 400 years, including Natives, and Spanish and eastern settlers. There are many historical sites, museums, Indian pueblos, and cultural experiences to participate in that celebrate these different groups. When you think of New Mexico, you probably don’t think of snow, but there is a Santa Fe ski resort with your name on it! In this region of the country, Santa Fe is one of the best areas to hit the slopes. The mountains can bring up to 300 inches of snow and with mostly sunny days, it is the perfect weather for this winter activity. 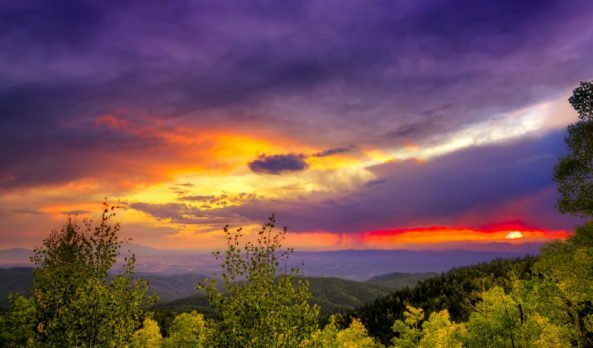 Much like the rest of the Southwest, New Mexico is loved for its blend Spanish, Native American, and southern taste. One common question asked when in a restaurant is if you would like, “Red or green?” which refers to the peppers you would like with your meal. Santa Fe will give you a new excitement for different spices. The airports most commonly used for travel to Santa Fe include the Santa Fe Municipal Airport in Santa Fe, the Albuquerque International Airport around 45 minutes away, and the Las Vegas Municipal Airport around an hour and 20 minutes away. Already Own a Santa Fe Timeshare?